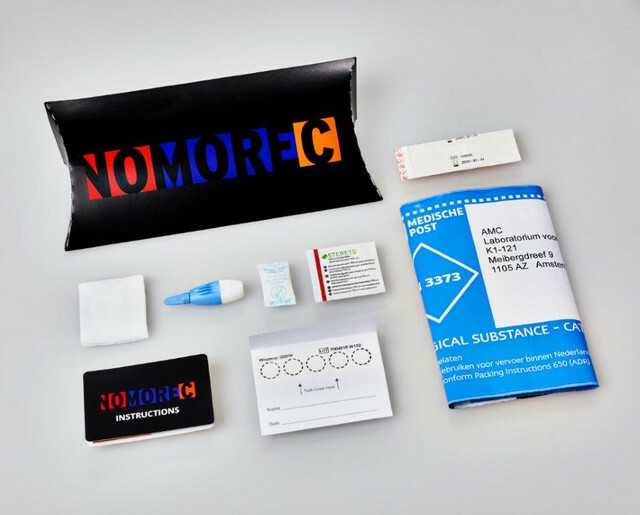 NoMoreC’s C-test lets you test yourself at home whenever it suits you. You take the test by pricking your finger to get a blood sample, which you then post to a laboratory at no cost. Your sample will be tested for the hepatitis C virus in AMC’s clinical virology laboratory, and your results will be ready for you online within a week. The service is completely confidential. The C-test is an RNA test that checks your blood for particles of the hepatitis C virus. It lets you know if you have been infected very soon after doing anything that put you at risk. We recommend you wait 14 days after running any such risks before taking the C-test. If you don’t wait 14 days, you might not have enough virus particles in your blood yet for the laboratory tests to detect the infection. The C-test is a reliable test, and it is suitable both for men who have never had hepatitis C before and for those that have. Click here to learn more about the different types of tests. How to use the C-test? Before testing yourself, watch the instructional video below and read the written instructions. You can read the written instructions here. The C-test costs €25 (or €80 for a pack of 4). The test kit is sent in a white bubble bag (padded envelope) without the sender's name or logo. If you order multiple tests, you will receive multiple envelopes. Note: We can only send the C-test to addresses in The Netherlands. C-test was €25 now only €15! You can now buy the C-test with a €10 discount by filling in the discount code THUIS when ordering the test. This is a temporary offer. 1. Go to 'Should I take a test?' and complete the online risk check to see if you have run a risk of hepatitis C.
2. Did you run a risk? Then create an account and order a C-test kit. 3. Take the test at home and send the blood sample to the laboratory – follow the instructions provided via this website. 4. The results will be ready in about a week. You will receive an email when your results are ready. To see the results, log in to your NoMoreC account. 5. Do the results say that you may have hepatitis C? Then ask your HIV doctor (if you have one), GGD Amsterdam’s STI clinic, or your GP to test you again. You must always take a follow-up test to confirm the results, if the first test says that you may have the virus. If the follow-up test also says that you have hepatitis C, the doctor who performed the test can arrange your treatment. If you order the C-test, we will ask you to create an account. You enter your e-mail address and password. You enter an authorization code. You will receive this code via Google’s Authenticator app. How this happens is explained when you create an account.